On a Sunday afternoon, I enjoy few things more than coming up with some new salad using the stuff from the farmer’s market. This week’s haul included yellow sweet corn, peppers and a great-looking bunch of cilantro. The result is a take on the familiar corn-and-black bean side dish, kicked up with lime, cumin and massive quantities of cilantro. 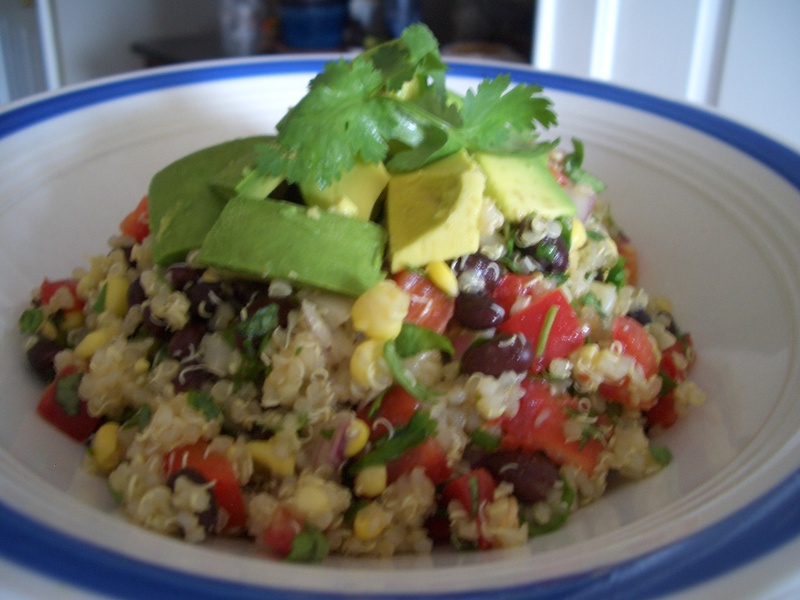 It would work with any grain instead of the quinoa, like bulgar, brown rice or couscous. Combine diced onion, red pepper, cilantro and corn. Stir in the cooled quinoa. In a small jar or covered plastic bowl, combine dressing ingredients; cover and shake until emulsified. Pour over other ingredients and mix. Top with the chopped avocado. You could also add some diced tomato or minced jalapeno if you want to. Serves four as a main dish. This entry was posted in Food and tagged Farmer's Market, Vegan. Bookmark the permalink.